I firmly believe that choosing what to wear back in the 1950’s was much easier than what it is today. Just think about it – women wore dresses and pearls everywhere, even while cleaning house, and men always wore suits. No one ever got caught looking unkempt because no one ever left the house looking less than their best. These days, I find myself running errands in yoga pants and flip flops with my hair in a ponytail; Mrs. Clever would have never done that. Further there’s the whole party invitation thing that sometimes includes a dress code and sometimes doesn’t. All this rambling leads me to this question – just what does smart casual, business casual, cocktail, and black tie really mean? Smart Casual – a term I’ve only recently started hearing, and one that I think is incredibly vague. After all, the interpretation is bound to differ person to person, so I’ll be honest and confess that I “googled” it. It said, “Neat, conventional, yet relatively informal in style, especially as worn to conform to a particular dress code. Think of a smart casual outfit as one that you'd wear for a movie or dinner date." Business Casual – something that I’ve written about several times, noting my disappointment with the fact that we’re taking this term way too far. Business casual used to mean khakis and a polo shirt on Fridays. Today, depending on what company you work for, it can mean jeans, a t-shirt, and flip flops, but if someone indicates business causal, it is likely that they mean less formal than a traditional business suit, but still intending to give a professional impression. I think khakis and a dress shirt fits the bill here. Cocktail – by far the easiest thing to dress for, in my opinion. 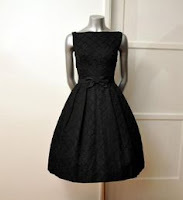 Men can wear a nice, dark suit, and women have a plethora of options here from a traditional LBD to a lovely, elegant (but short) cocktail-type dress. Be sure not to overdress and pick a floor length gown, and remember it is a bunch of people standing around drinking cocktails and enjoying canapes so a dress for clubbing is not appropriate here either. Black tie – for men, this one is exceptionally easy; they simply wear a tux. For women, on the other hand, it’s a little more difficult. Tradition says to choose a full length gown, but as fashions change, I’m seeing lots more sources suggest formal separates, statement skirts, and dressy combos, as long as they go past the knee. But as Karl Lagerfeld said, “No one is over-dressed or underdressed in a Little Black Dress.” I have 4 different but rather classic versions of the LBD, and whenever I am in doubt, I always go with one of them.